On September 15, 2015 the new ISO 9001:2015 Quality Management System standard was released and made available to the general public. Organizations that are presently certified to ISO 9001:2008 are required to transition their existing quality management system to ISO 9001:2015 by September 15, 2018. A three-year transition period has been mandated.The diagram below is a visual representation of the transition period. 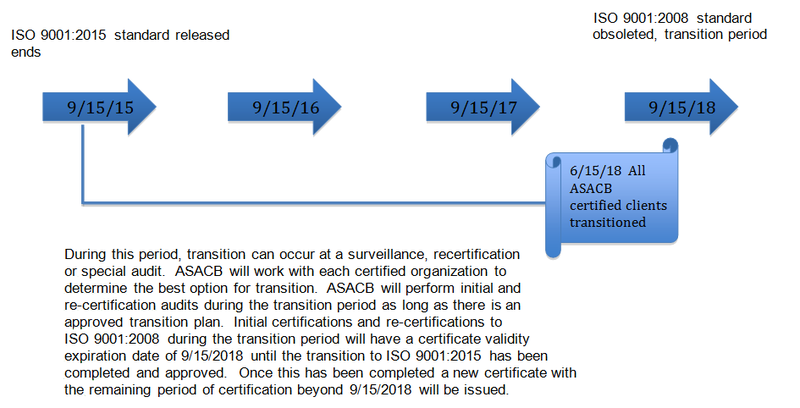 ASACB has created several tools to aid Clients during the transition.Other than the Transition Plan Milestone Form, none of the tools are mandatory, rather they were created to provide assistance where needed. ASACB shall require all Clients to complete an ISO 9001:2015 Transition Plan Milestone Form which will be provided by ASACB upon request or downloaded from our website. The transition plan will allow Clients and ASA to plan individual transitions for each company in order to insure that no deadline is missed. 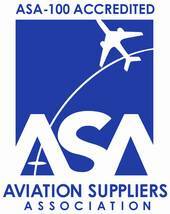 If you should have any questions regarding the transition policy and the expectations of ASACB please call ASA or email Sam O'Connor, Vice President of Technical Services,.